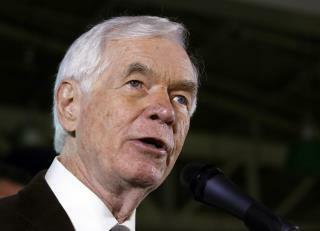 (Newser) – Longtime Republican Sen. Thad Cochran of Mississippi said Monday he'll resign because of health problems—triggering what could be a chaotic special election to fill the seat he has held for a generation. Cochran, who turned 80 in December and has been in poor health, has been a sporadic presence on Capitol Hill in recent months, the AP reports. He stayed home for a month last fall, returning to Washington in October to give Republicans the majority they needed to pass a budget plan. He has since kept a low profile and an aide ever present at his side. "I regret my health has become an ongoing challenge," Cochran said in a statement. "It has been a great honor to serve the people of Mississippi and our country." Cochran's been senile for years...but to the trumplings, he's still a genius. Tea party, Palin .... sorry duded trump has out nut nagged the lot of you. Still, lets see another red state implode under ridiculous tea party ideology. Kansas anyone?